Houston-based architecture firm SWA Group has heads spinning today: Is their proposal to build a bikeway next to the Keystone Pipeline pure satire or a serious attempt to “bike-wash” the most reviled fossil fuel distribution project of our day? 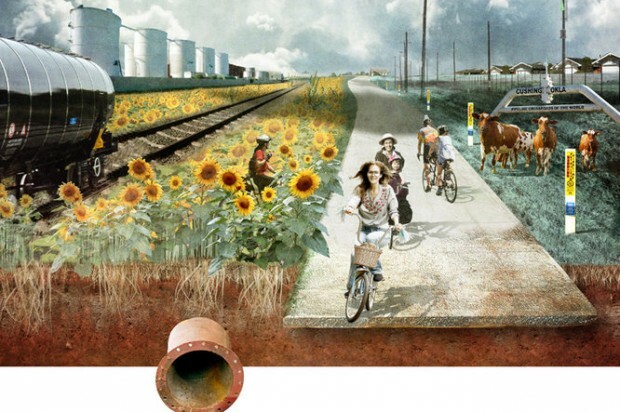 SWA developed this idyllic rendering and sent it to the State Department and TransCanada, calling for a bike path alongside the proposed 1,300-mile Keystone Pipeline. The firm acknowledged that the drawing was tongue-in-cheek but insisted to Bloomberg that the proposal was serious. Apparently, SWA thinks the bikeway would defuse opposition to the pipeline and attract tourists. That’s too bad, because as satire, it’s pretty sharp. A version of this happens all the time in cities: Proponents of an expensive boondoggle road project that will do nothing but encourage long, life-sapping commutes slap a bicycle path on the plans and call it a “multi-modal” corridor to placate opposition. Environmentalists still aren’t sure the Keystone bikeway isn’t a joke. “Seriously, this can’t be for real,” said Tiernan Sittenfeld of the League of Conservation Voters. “I think it’s ridiculous,” said Jane Kleeb, of Bold Nebraska, a pipeline opposition group. A spokesman for TransCanada rejected the proposal, saying the corporation doesn’t own the land where the pipeline is planned and that any structures would block access to the pipeline. Meanwhile, Salon reports the bike lane proposal would cost a cool $400 million. Its definitely a sign of the power of the Bike Lobby. Actually kinda like it… strange and amusing but it would be useful if they make it a robust path. If the bike lobby was powerful we’d be hearing about plans for a transcontinental bikeway. With all construction materials brought in by bike. Why is it “ridiculous”? It looks to me like a compromize. Glad to see this being called out. Seems like a pretty cool use of a maintenance/inspection pathway. *ahem* Happy April Fools Day. If it’s not satire, it takes bike-washing to a whole new level. It appears putting a bike on it has, for marketing purposes, surpassed putting a bird on it. Why not a yellow brick road while we’re at it?
? The sunflower is the symbol of the Green Party. So naturally it’s going to be used by Keystone XL just as it was used by “Beyond” Petroleum. Yes, this bikeway will help drastically reduce fossil fuel use among people commuting between Nebraska and North Dakota! I think the shadow of those ominous clouds over the bike path makes it clear that this is a bit of satire. I hope they find ways to safely clean tar sands “crude” off of the flowers, grass, bicyclists, & cows in this surreal plan. Marshall MI & Mayflower AR still have a lot of it around from pipeline spills, it does not behave like conventional crude when trying to clean it up. Enbridge has spent over a $ Billion in Michigan, & it’s still a mess. Satire aside, a Canada-to-Caribbean bike path is an awesome idea. I just don’t think they should build an oil pipeline alongside it. Is the pipeline a horrible idea? yes. If they are going to build the pipeline either way, should we make them add the bike path? totally. The sunflowers remind me of the famous “Daisy” Ad of the LBJ campaign in 1964, so, yes, well-played. What If Climate Hawks Fought Dirty Highways Like They Fight Dirty Energy?